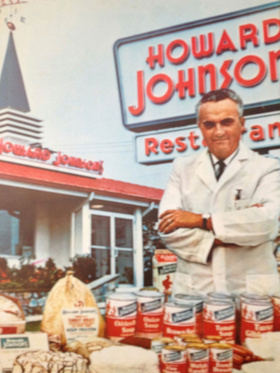 Pierre, along with Jacques PÃ©pin, then an aspiring and talented young cook on the staff of Le Pavillon, were both hired by the hotel and restaurant entrepreneur Howard Johnson, Sr. (a regular client at Le Pavillon) to revamp some of his chainâ? ?s recipes as well as add more notable items such as Beef Burgundy. Johnson challenged Pierre to cook for the masses instead of the elite. The nine to five, week-day job allowed Pierre to spend more time with his family and collaborate with Craig Claiborne on weekends, often in East Hampton, NY, creating recipes for The New York Times as well as assisting with restaurant reviews. Together, over a twenty-year collaboration, Craig and Pierre wrote weekly food articles, restaurant reviews and Sunday Magazine recipes for The Times and co-authored ten books. In 1975, Pierre moved on from Howard Johnsonâ? ?s to begin his own syndicated byline, â? ?The 60 Minute Gourmet," for the new â? ?Livingâ? (now Food) section of The New York Times. His widely-read column, which appeared in over 360 newspapers worldwide, led to a second column entitled â? ?Kitchen Equipment,â? which also appeared in the Timesâ?? Living section. 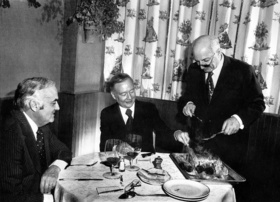 That same year, Pierre and Craig Claiborne made international headlines when Craig won a Public Television fundraiser sponsored by American Express garnering dinner for two with an unlimited budget at any restaurant in the world. Choosing a small, obscure restaurant in Paris called Chez Denis, Craig and Pierre ate and drank their way through thirty-one courses. Beginning with Iranian beluga caviar and Champagne, the meal included three soups, a parfait of sweet breads, tartelettes of quail mousse, a gratin of lobster and truffles, fillets of wild duck in red wine sauce, oysters in beurre blanc, foie gras in aspic, a chaud-froid of woodcock, fillets of beef and ortolans en brochette (small whole birds eaten in one bite). Wines served included a 1918 Chateau Latour, 1928 Chateau Mouton Rothschild, 1969 Montrachet Baron Thénard, 1917 Chateau Lafite Rothschild, 1961 Chateau Petrus and a 1929 Romanée Conti. Three desserts completed the meal, served with a 1928 Chateau dYquem followed by a 1835 Madeira. The check for the single, four-hour meal totaled over $4,000 including taxes and tip (the equivalent of over $16,000 today), garnering considerable coverage in the press.